Here’s an interesting item. Got a call and email from Stew Lingley, USNA ’62. "Hi Jack, We (USNA 62) had 137 NAPSters, Naval Academy Prep School, students start with us, 103 of whom graduated. Earlier this year, they had a 50th reunion of their graduation from NAPS in 58. I am the list keeper for the USNA 62, so I was helping them with contact information. According to the list keeper for NAPS 58, there were about 27 of their classmates who attended USAFA. Do you know who they are, and can you a share their contact information with the NAPS coordinator? Tom Moore is the brother of my sister's husband. He gave me your contact information. Stew Lingley, USNA 62, 703-556-0144, McLean VA.” I sent this information to the Redtag Net. So far, Carl Bolster has admitted graduating from NAPS. Any one else interested in fessin’ up? Don’t worry, it won’t hurt your promotion chances….I think. Speaking about the Redtag Net, I want to thank Owen Hawkins on behalf of the Redtags for sponsoring the Redtag Net for us. His time and effort are greatly appreciated. It makes communicating with classmates infinitely better. Well Done Owen!! On August 31, George Thompson and Chuck Cheeseman, with George’s son-in-law whose name I didn’t catch with all the noise around, met up with Colin Richardson and me in a local blues bar & grill. 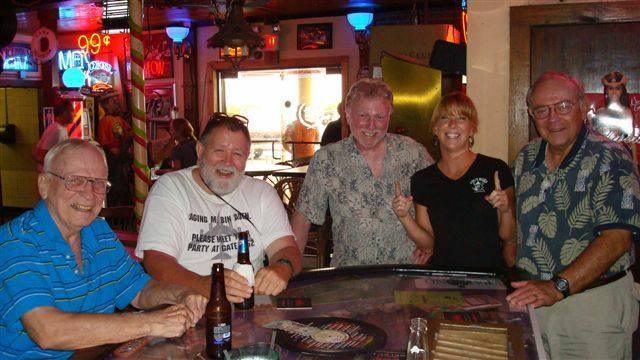 After a while, a blues band started playing and I didn’t catch very much of the ensuing conversation. The accompanying picture shows the waitress depicting the length or width of something that I also didn’t catch. But with Colin, George and Chuck contributing, I probably couldn’t print most of the conversation anyway. Let’s just assume it was a fish story. Besides that, we had a good time together. George was on a whirlwind tour of the country trying to visit as many friends and family as possible before heading back to Russia. On the 50th anniversary of our entrance into USAFA, a contingent of Redtags drove down to Lowry to take some pictures of the remnants of the USAFA site there. Here’s Jim Mack’s report: "Hi Jack, We had 7 guys trundle up to Lowry and the remains of our world of 50 years ago for the picture seen. The steely-eyed vets are L-R: Bob McNaughton, Huck Spory, KB Clark, Bo Ohman, PK Robinson, Rip Blaisdell and Jim Mack. Wish you all could have been there. The manager/caretaker of the Lowry Aviation Museum gave us a special tour. Fun day w/ lots of stories, some true. Jim"
Al Sigman dropped me an email. He read in my last column that some Redtags visited the old Academy at Lowry. : "Jack, I noted in Checkpoints that several Red Tags visited Lowry on the 50th anniversary of our arrival there. I wish I had known about their plans. I am in my 5th year as Director of Real Estate for the Lowry Redevelopment Authority. I handle all of the sales of Lowry property to residential and commercial builders. It is a real treat to be involved in the transformation of the base to a civilian community. The changes are quite dramatic and we have been fortunate to be considered one of the real success stories of base redevelopment. Not many of the buildings are left on the old Academy site. The Commandant’s Building is still there and was designated a Historical Building last year. About a dozen Grads from the first four classes attended the ceremony. The Quadrangle is still there but the dorms are gone. The Chapel has been moved to the west part of Lowry adjacent to the Town Center. It is now used for public meetings. A few of the academic buildings are still standing. There is a "Lowry Room" in the Wings Museum that is full of items from the early Academy years such as copies of Contrails and the original uniforms. There are class pictures of the first four classes hanging on the wall. 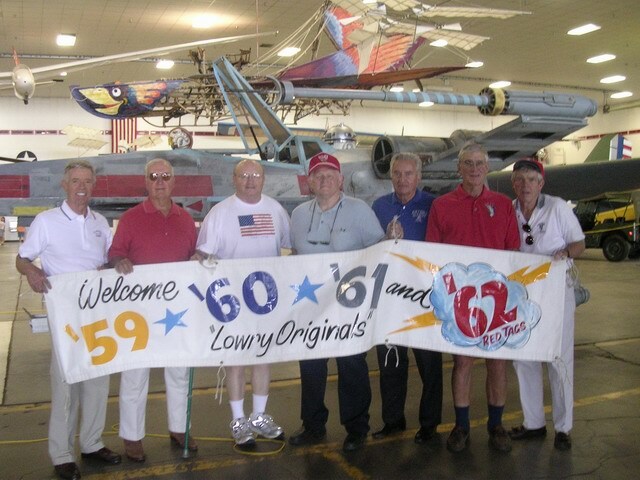 Both 59' and '61 had gatherings here to commemorate the 50th anniversaries of their arrivals at Lowry. I got to see quite a few of the "old guys" and they were glad to have another opportunity to chew out an "RTB." I know we put this in the class news several years ago but I would like to renew the invitation to visit Lowry to anyone in or passing through the area. I expect I will be working at Lowry until late in 2009. Thanks again for all of the work you have done for the RTB's. 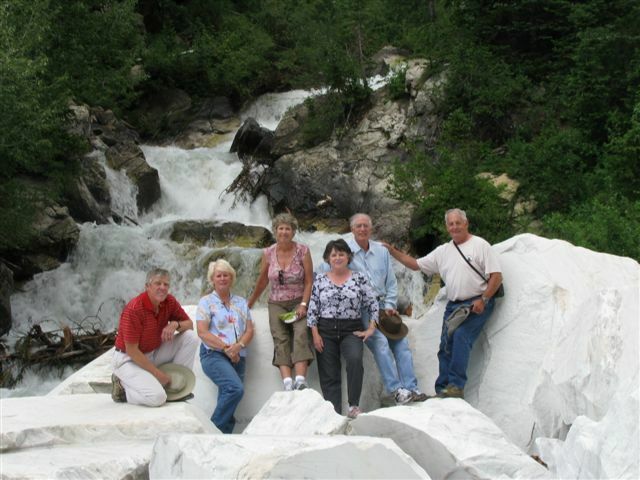 Al Sigman"
Three Redtag couples spent time at Marble, CO in the summer. Enjoying the waterfall are from L-R: Jim & Penny Mack, Carol Staples, Rose and Don Shepperd, and Jon Staples. Got this from Ed Martinelli this summer. " Hey. Has anyone heard how Logan Babin and his family have made out? His hometown -- Houma -- was right on Gustav's path. And how did Tom Young weather the storm?" Mike Quinton heard from Logan and put the email on the Redtag Net, to wit: "Anne & I are back in Houma now. We still do not have electricity at our home though we have a generator that supplies our power needs. Our office is up and running with minimal damage (one window blown in). Thank you for your thoughts and prayers. It could have been a lot worse." I can sympathize with Logan. Our town of Satellite Beach got over 24 inches of rain when Tropical Storm Fay wandered through. Luckily my street is not in a low point so we had no flooding in the area. I’m sure Colin Richardson heard a lot of people blaming it all on Global Warming which probably raised the hair on his head, all 200 strands of it. Just kidding with you, Colin. I have a picture from a gathering in Southern Calif. I lost the verbiage but I think it was hosted by Mike Quinton in San Diego. 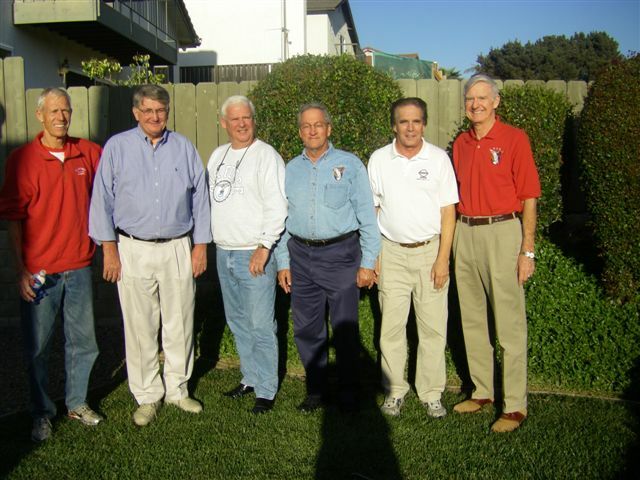 L-R: Dave Bockelman, Willie Holbrow, Russ Goodenough, Charlie Hale, Roger Smith and Mike Quinton. John Flanagan writes: "MariJo and I are once again, 7th year, hosting the pre Army- Air Force game dinner in New York city. We welcome the Superintendent, his staff, and the CEO of the AOG to the Union League Club." Air Force should win. From Chuck Allport: "Chuck Allport has left the academic world and is supporting the Air Force at WPAFB in their aggressive effort to get a substantial proportion of required aviation fuel from domestic synthetic sources ..... CTL, coal-to-liquid." That about wraps it up. It should be Christmas or later by the time you read this. So a Merry Christmas and Happy New Year to you all. Please drop me a card and/or note.